Did you know that there are tons of funny talking dog videos on Facebook? It’s true! YouTube may have the largest collection of videos in general, but more and more people are posting their humorous clips directly to their Facebook pages. I love this because I spend a lot of time on the social media platform, so I can get my daily dose of dog humor right alongside my updates about my friends. 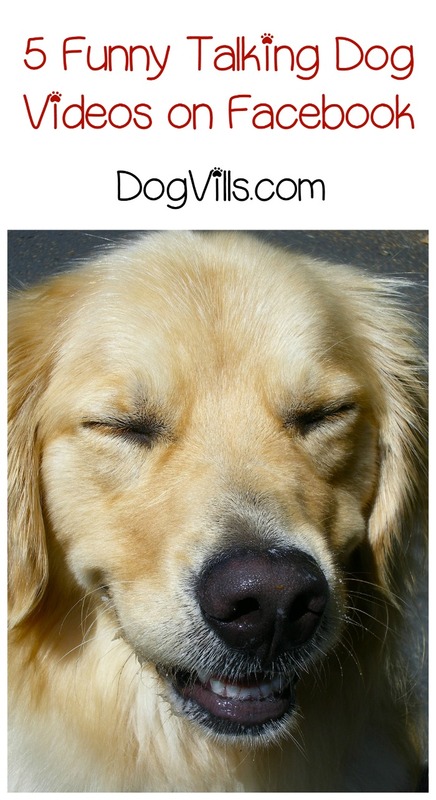 Check out a few of our favorite funny talking dog videos on Facebook! Marifer’s World– While this video does originate from YouTube, it did appear on Facebook as well on October 20, 2016. The dog’s name is Kinzi and she is a Puggle dog, ½ Pug and ½ Beagle. She has her own show on YouTube called The Kinzi Show. The purpose of The Kinzi Show is for Kinzi to teach kids how to do things like pet a dog and clean a mess. In this video, she is trying to find the perfect Halloween costume. She tries on several dog costumes like a hot dog, regal peacock, and German girl. Watch the video to find out which one she chooses. Rumble– Charlie is a talking dog who engages in a hilarious conversation in this video. He is trying to have a conversation with his owner. While it seems like all he is saying is blah blah blah, he does throw in a hello or two, when prompted by his owner. The video was posted on July 25, 2016 and has 14,158,333 views to date. Rumble is a popular video site that currently has 401,724 likes on its Facebook page. Mishka the Talking Husky– Mishka is probably one of the most popular Siberian Huskies around today. Her name means teddy bear in Russian and she was born on June 16, 2002. Mishka even has her own Facebook page which currently has 1,000,727 likes. In this adorable video, Mishka says I love you, mimicking her owner, as clear as day. The video was posted on her Facebook page on March 14, 2015 and currently has 1,950,706 views. K9 Instinct– K9 Instinct is a popular Facebook page that currently has 1,548,503 likes. In this video, Leia, a gorgeous dog, prompted by her owner, says “how now brown cow.” The video was posted by K9 Instinct on June 28, 2015 and has received 1.5 million views to date. Rhett Barkley– Rhett Barkley has to be one of the cutest dogs around. He is a Golden Doodle breed of dog. In the video, he talks about how he was kicked off his regular Facebook page because he is a dog and now has a home on a Facebook pet page. Like Mishka, Rhett Barkley has his own Facebook page that currently has 1,380 likes. Have you seen any other funny talking dog videos on Facebook? Share in the comments!